Utah signed 12 players in December and has scholarships for another eight to 10 signees. 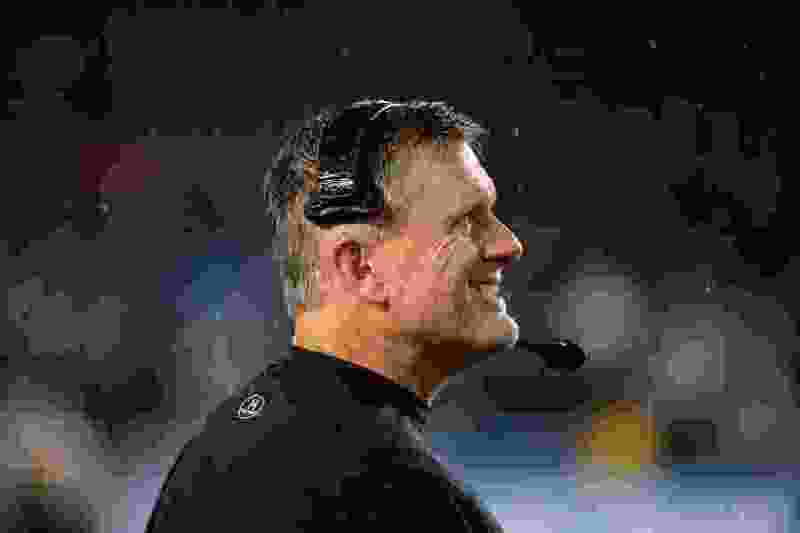 (Trent Nelson | The Salt Lake Tribune) Utah Utes head coach Kyle Whittingham looks to the scoreboard late in the fourth quarter as the University of Utah faces Northwestern in the Holiday Bowl, NCAA football in San Diego, Calif., on Monday Dec. 31, 2018. Utah entered this week’s final phase of football recruitment hoping that a running back from the recruiting hotbed of Southern California or a lineman who stands a foot taller and learned to play American football in London would cap the Utes' 2018-19 effort. Jordan Wilmore, a 5-foot-8 high school back, and Bamadeli Olaseni, a 6-8, 320-pound offensive tackle at Garden City (Kan.) Community College, have the potential to elevate Utah's class Wednesday. If the Utes could land both Wilmore and Olaseni, then “this suddenly turns into a really good class,” said Alex Markham, publisher of Ute Nation on the Rivals network. Tuesday night, Olaseni announced his commitment to Utah. Wilmore recently visited Arizona State; the Sun Devils may have become the front-runners for him. Locally, Utah's biggest target is Bingham High School defensive tackle Simote Pepa, who likely will choose between Utah and BYU. Utah has tried to stay in the game with Orem receiver Puka Nacua, who committed to USC last summer, but is now taking another look at his options. Nacua recently visited Washington. The Utes signed 12 players in December and since have added a prep lineman and a quarterback who’s transferring from Texas. Utah coach Kyle Whittingham has scholarships available for another eight to 10 players, with receiver Siaosi Mariner and tight end/defensive end Caleb Repp transferring to Utah State. Utah has solid commitments from JaTravis McCloud, a cornerback from Tulsa, Okla., and Junior Tafuna, a linebacker from Bingham, who plans to join the program in 2021, following a church mission. Pepa, Tafuna's teammate, apparently will decide between Utah and BYU. Bingham running back Braedon Wissler is coming to Utah as a preferred walk-on and is projected as a slot receiver. Drew Rawls, a safety from Beaumont, Texas, committed to Utah on Tuesday. Other potential Utes making their choices of schools this week include Elijah Juarez, a linebacker from Long Beach, Calif.; Sione Vaki, a safety from Brentwood, Calif.; and Drew Fowler, a linebacker from Bellevue, Wash. The Utes are set at quarterback in this scholarship class with Texas transfer Cameron Rising, but he won’t be eligible to play until 2020. Carter Robinson, a walk-on from Appleton, Wis., is committed for 2019. Utah has longstanding commitments from Darren Jones, a 6-8 receiver from San Bernardino, Calif., and LaColby Tucker, a 6-9 offensive tackle from Garden City CC, although questions exist about their academic status. The Utes' signees in December included five high school offensive linemen. Luke Felix-Fualalo, from Santa Ana, Calif., announced his signing in January. Having lost starting safeties Corrion Ballard and Marquise Blair to graduation, Utah is likely to keep looking for a graduate transfer at that position, although 2018 backups Philip Afia and Terrell Burgess have some experience.